What do you say when you walk through your yard and you realize there has been a car accident, come and gone? Stacey was the first to see four hemlocks that were "felled" by the apparent accident. 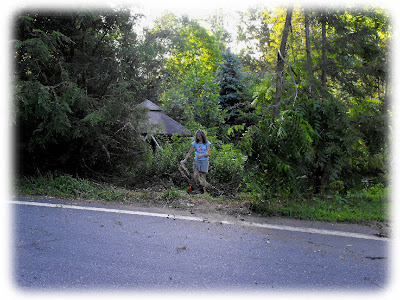 We found out that there had been a car that had run off the road damaging the row of hemlocks near our pond while we were away for a couple of hours that Saturday evening. The State Patrol claimed that the trees were within the State DOT right of way and so no insurance claim could or would be made. Wow! No note. no nothing. Just a big mess to be cleaned up. Around here if a large tree falls into the road after a storm you bet there will be some chain saws buzzing away no doubt from the DOT "call list" of boys with saws, trucks, and wood stoves. But in this case four eight inch (in diam) hemlocks didn't warrant the DOT to have this sight cleaned up. Broken glass, plastic BMW parts, a rear view mirror all left behind. They could have at least left a note. OK, now that that rant is off my chest I can move on to the news of the day! Toni Campanella is back from Cleveland for some summertime fun at Penland and here to work at the pottery. First off, we packed a bunch of pottery that was waiting to get out into the world. Some pots went to Dow Studio in Deer Isle, Maine! So look out Down Easters for some southeastern pottery! Better late than never...Another is on its way to the Ohio University wood fire conference, in Athens Ohio. Check out the blog that Bryce is keeping to highlight the events there. 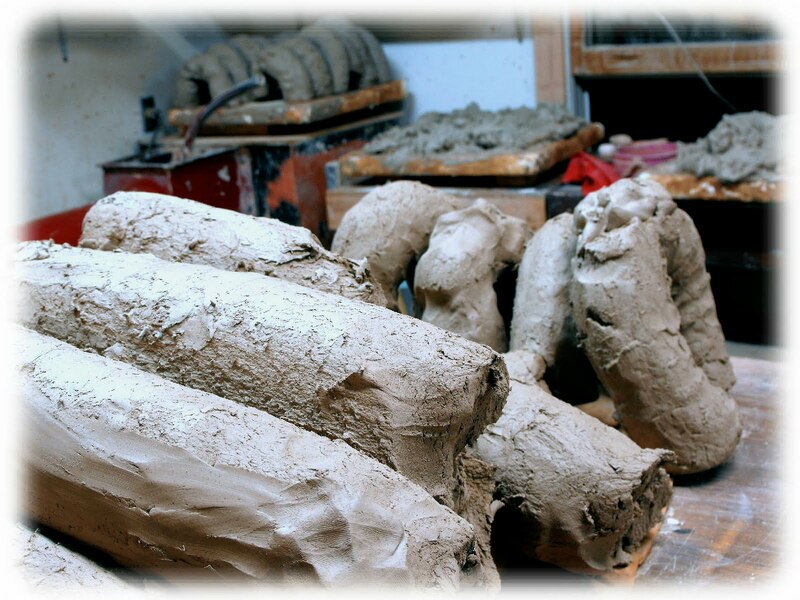 We also pugged some of the clay that was ready and left some that was just too damn soft. I tended to the plates I threw the other day and tried to fashion a new wire tool after my Mudtools wire broke. I've been trying to pay special attention to the handling (cutting off, flipping) of the plates and hoping to get less warping this time around. I had cut the plates off after they were thrown, but they had to be cut again. It was asking a lot for the wire to go through the drier plates. I'll try to blog about the repair of that Mudtool wire tool, because it is possible. But if you want to buy me a new one that would save me from myself!